Every so often someone comes out with a Stanley Cup compendium. It may be from the NHL itself, or the Hockey Hall of Fame, or an unaffiliated project from one of the major publishers. Regardless of who is behind the projects, the books tend to be quite formulaic. They look back at Stanley Cup playoffs past, either year by year or era by era. They are dominated by a wide range of black and white and color photography that really steal the show. More often than not it is a good thing that the photography dominates, because the texts in these books tend to gloss over the years and eras with the briefest of summaries. It kind of has to, because it would take several volumes to truly chronicle the Stanley Cup's history. But still, the writing is too often pedestrian. That was certainly not a concern with 2001's Quest For The Cup: A History Of The Stanley Cup Finals, arguably the best book of this genre ever produced. Key Porter Books was behind this book. They spent a pretty penny securing some great photography from the Hockey Hall of Fame, Bruce Bennett, and the Canadian Press. But they wanted an impressive text to match. They did not just want the normal retelling of facts. They understood the Stanley Cup represents many stories, some of the greatest stories ever told. Key Porter wanted a great story teller to front this book. They found the best: Jack Falla. Few can match the literary genius of Falla. He enthusiastically agreed to be the project's general editor, but he also wrote the most recent couple of decades. Falla headlined an all star cast of writers - Jack Batten, Lance Hornby, George Johnson and Steve Milton - that delivered a Conn Smythe trophy worthy performance. Falla had written five previous books at the time, in addition to writing for Sports Illustrated and teaching sports journalism at Boston University. He was easily qualified for the project. That being said, he did have to put aside his highly personal writing and stick more to facts. But most importantly he understood it's unique challenges. First and foremost on the list of challenges was delivering a uniform voice without taking anything away from five fantastic writers. Falla delivered perfectly. The writing is a joy to read, never labouring like similar projects. The book is full of lore and history. 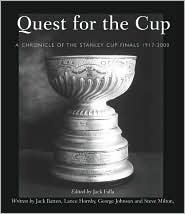 Bearing in mind that this book is now nearly a decade old, Quest For The Stanley Cup remains your best choice in your quest for a great Stanley Cup book.